This is my Dragon’s Dogma character, Gaia. She makes the cutest 'oh no!' face and has the most adorable sprinkle of freckles across her nose. She also has a gaping hole in her chest that’s been sewn up by magical influences, but...don’t worry about Gaia. She’s been through a lot in the last three years, facing innumerable adversaries and apocalyptic environments across such fabled lands as Ferelden, Tamriel and Amalur. Gransys is merely her most current challenge, and I believe that she (and I) have what it takes to fight the unspeakable foe and save the land...again. I love character creators. Instead of being forced to develop a relationship with a predetermined protagonist, the player is allowed the freedom to explore options that help build a more tangible connection between him or her and the in-game avatar, forging an instant bond between the controller and the controlee. This seems to be the norm in most RPGs nowadays, even if the main character is already partially preset, such as Hawke and Shepard in BioWare’s franchises. When I started playing Dragon Age: Origins for the first time, I delved deep into the facial construction options and body type manipulators and created Gaia. I chose human mage as my race/class, gave her some fetching green eyes and a staff to yield in battle. And she and I have been together ever since. Originally, Gaia was a feisty redheaded mage who loved a gentleman named Alistair, seduced a saucy elf named Zevron and saved Ferelden from an arch demon. 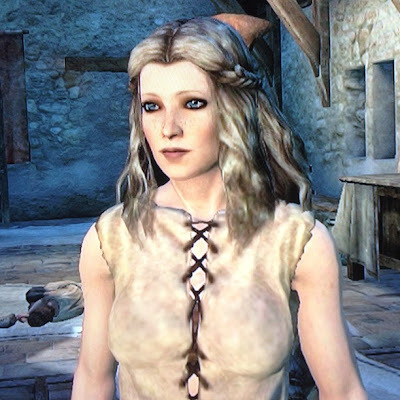 When I moved on to Dragon Age 2, Gaia spent her years in Kirkwall earning the legendary title ‘Champion’ and defending mages with her partner Anders (this didn’t turn out so well), which turned her hair a beautiful silver but left her stronger than ever. When Gaia moved to Tamriel, she learned how to handle both her spells and a quick-bladed sword, and mastered a tongue-twisting ancient language, to relieve Skyrim of its ‘dragon problem’. In Amalur, Gaia entered the land of the faery to put an end to a civil war between the winter and summer courts, losing her destined fate in order to gain the respect of a nation. Gaia is all of these things, and Gaia is part of me, as we have evolved and developed together. She has become my common character across different discs, developers, publishers, scenarios and settings. And there is something very comforting about this, in knowing that through a tabulated character creator I can gain access to someone familiar, and in knowing her from previous times, I know her now, and I always know how to proceed with her training and appearance, her demeanor and dialogue choices. And she always wins the day, no matter what the obstacle. I am finding myself quite in love with Dragon’s Dogma. Its pawn system is very different than anything I have played before, and my favorite part so far is finding player pawns in the real world and sending them back with items and equipment. The ultimate gift-giver. My created Strider pawn, Enkir, is sort of grouchy (two character creators-I am in heaven), but every time I hand him a poisoned arrow, he never fails to hit his mark.